In the village of Woodstock we have a great source for New Zealand organic Wild Salmon named Woodstock Meats. Their fish is delivered daily and has never been frozen. 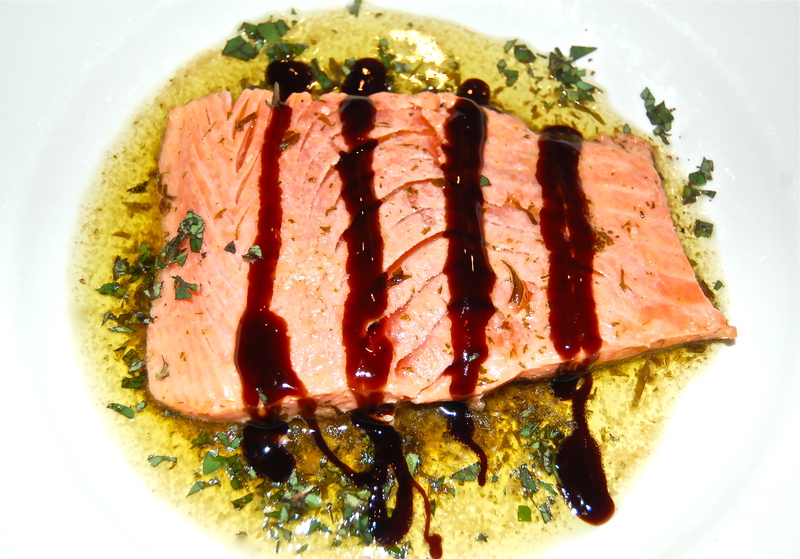 To prepare this dish, the Salmon needs to be placed in the freezer for about an hour. At that point it’s solid enough to carefully slice horizontally in half. The two slices will be about 1/4″ thick and require no more than thirty seconds a side in a buttery pan to cook. * To make your own, Melt 2 ounces of Butter over low heat, add Balsamic Vinegar & simmer for about 10 minutes or until the sauce has thickened. If necessary add an extra TB of Butter. 1. Slice the nearly frozen Salmon fillet carefully in half, (an electric knife helps). Season the two slices liberally with Salt & Pepper. 2. Heat a deep sided saute pan to medium, add half the Butter (2 ounces), when it stops sizzling, add the Salmon & cook for 30 seconds per side. 3. Remove with a slotted spatula transfer to a holding plate. Cover with tin foil to keep warm. 4. Add the remaining 2 TB of Butter to the saute pan & 1TB of Vermouth. Over high heat whisk them together to emulsify the sauce. Add half of the chopped Parsley. 5. Plate & spoon the Vermouth Butter sauce onto each plate, top with a fillet, sprinkle on the Parsley & serve.